Home BUSINESS Madaraka Market traders to get compensated for the 2015 fire losses – Waititu. Madaraka Market traders to get compensated for the 2015 fire losses – Waititu. Kiambu Governor Ferdinand Waititu addressing residents and traders of Madaraka Market Makongeni on Saturday where he promised to work out a programme for compensation for those who lost their property in the 2015 fire. Kiambu Governor Ferdinand Waititu alias Baba Yao has promised to ensure that Madaraka Market traders who lost their property in the November 2015 inferno will be compensated. 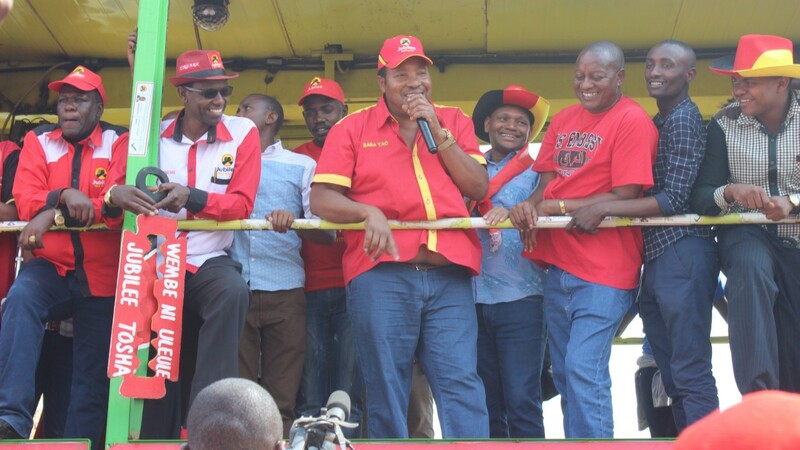 Speaking to the traders during a campaign tour for the reelection of President Uhuru Kenyatta over the weekend, Waititu said that his government will ensure that all those who were affected got back on their feet again within the shortest time possible. He also set out plans to rebuild the market into modern standards to ensure that it accommodated every one of them. “We are going to collect and keep record of all those trading in this market and give you ‘Soko IDs’ for easier identification so that none of you is left out during the allocation of spaces in the new market,” said the governor. Waititu added that the market will be done in phases to minimise interruptions of the day-to-day running of the market. Among other improvements, he promised to build enough toilets, work on refuse disposal and cleaning of the market as well as improving on security lighting. Baba Yao reiterated his earlier promise that salons, kinyozis and mama mbogas will not be required to pay any business licences in order to operate. While speaking near the Whiteline stage in Thika Town, Waititu promised hawkers that he would sit down with them and come up with a lasting solution to their problems. He also vowed to protect them from harassment by police and county askaris, saying that he should be handled with the respect they deserved. “I will not allow anyone to harass you, whether they are policemen or county askaris. And if at all anyone has confiscated your wares, I order them to return them to you immediately or I will personally get them for you and force them to pay for the time you have lost without selling your goods,” warned Baba Yao. He promised to revise downwards all county rates and charges so as to make Kiambu business and investment friendly. “With your participation, we are going to reduce licences to make them affordable. We will also ask THIWASCO to consider reviewing its water rates as we provide water to all the homesteads in the county,” he said at Ngoliba. He promised to improve on all the key road networks in the constituency, including working out a programme to tarmac the Kilimambogo- Ndunyu Sabuk Road and some other key roads in Kamenu and Ngoliba wards.